OTTAWA, Dec. 2, 2015 /CNW/ – The Transportation Safety Board of Canada (TSB) investigation (R13T0192) into the September 2013 collision between an OC Transpo bus and a VIA Rail train in Ottawa, Ontario, identified numerous contributory factors including company practices, work-related driving distractions, speed, the configuration of the Transitway, and bus crashworthiness. As a result of the collision, the train derailed and the bus was extensively damaged. Six people, including the bus driver, died, and 34 passengers sustained injuries. There were no injuries to the crew or passengers on the train. On September 18, 2013, at 0847:27, OC Transpo double-decker bus No. 8017, operating as Express Route 76, left the Fallowfield Bus Station in South Ottawa enroute toward downtown Ottawa along the Transitway. Around the same time, the automatic warning devices, consisting of flashing lights, bells and gates at the Woodroffe Avenue and Transitway railway crossings were activated and fully functional. Meanwhile, VIA Rail passenger train No. 51 was approaching these crossings. The train was within normal operating parameters and slowing down to approach the Fallowfield train station. When the train crew realized that the bus would not stop in time, the emergency brakes were activated. About 3 seconds before impacting the train, the bus driver released the throttle and applied the brakes 35.6 metres away from the point of collision. The accident occurred at 0848:06 just 39 seconds after the bus left the passenger terminal. The main question focused on “Why didn't the bus driver see the train and stop in time?” The investigation determined that, while accelerating toward the railway crossing, the bus was negotiating a significant left curve in the road. The driver's view of the crossing was obstructed, and there was only a short time when the activated crossing signals were visible to the driver. During this critical time, the driver was also distracted by surrounding conversations about seating on the upper deck, and by the perceived need to monitor the upper deck on a small screen that was positioned up and to the left of the driver's seat and to make an announcement about no standing on the upper deck. At the speed the bus was travelling, the driver was unable to stop in time, even after passengers began to shout “stop”. “Given the same circumstances, this accident could have happened to just about any driver,” said Rob Johnston, the Investigator-in-charge. To address the major safety deficiencies identified in the investigation, today, the Board is issuing five recommendations aimed at reducing the risks. The recommendations deal with the installation and use of in-vehicle video displays, crashworthiness standards, data recorders for commercial passenger buses, and grade separations at busy railway crossings, both in Ottawa and across Canada. The TSB is online at www.tsb.gc.ca. Keep up to date through RSS, Twitter (@TSBCanada), YouTube, Flickr and our blog. VIA 51 departed from the Ottawa Station. The bus arrived at the OC Transpo Fallowfield Station, south-side bus shelter. Passengers exited the bus and other passengers entered the bus from the front and side doors. A passenger (cyclist) secured a bike on the bike rack at the front of the bus. The side door of the bus closed and passengers continued to board at the front door. The train was proceeding at 80 mph (128.7 km/h) approximately 1 mile (1.6 km) east of the crossings. The LE applied the locomotive dynamic brake and train service brakes and began to slow the train in preparation for the stop at the VIA Fallowfield Station. The bells and lights at the Woodroffe Avenue and Transitway crossings were activated about 49 seconds before VIA 51 arrived. The train had slowed to 75 mph (120.7 km/h) approximately ¾ of a mile (1.2 km) east of the crossings with the locomotive dynamic brake and train service brakes applied. The bus departed from the OC Transpo Fallowfield Station. The Transitway crossing gates were fully down about 26 seconds before VIA 51 arrived at the crossing. The bus was travelling at 42 mph (67.6 km/h) with throttle (gas pedal) on. The bus was travelling at 42 mph (67.6 km/h) with no throttle (gas pedal) on. The bus speed reduced to 35 mph (56.3 km/h) with no throttle on and the brakes applied. The train was proceeding at 47 mph (75.6 km/h) with the locomotive dynamic brake and train service brakes applied. The LE activated the train emergency brakes and engine bell. The bus speed reduced to 25 mph (40.2 km/h) with no throttle on and the brakes applied. While travelling at 46 mph (74.0 km/h), the train arrived at the Transitway crossing. The bus struck the south crossing gate, initiating a broken gate alarm on the crossing signal log. The bus speed reduced to approximately 5 mph (8.0 km/h) with no throttle on and the brakes applied. The bus collided with the south side of the train. The train slowed to 43 mph (69.2 km/h). The electrical wiring for VIA 915 was severed and the LER stopped recording. 1. Although the crossing protection was activated, the bus did not stop as required and struck the train as the train entered the crossing. 2. Locomotive VIA 915's lead truck followed the main track while its rear truck derailed on the Transitway crossing when the locomotive was contacted by the bus chassis. Then, the rear truck of locomotive VIA 915, along with the lead truck of the first car (VIA 3455), took a diverging route into the VIA Rail Canada Inc. siding. 3. As locomotive VIA 915 and car VIA 3455 jackknifed, the lateral restraint capacity of both tracks was exceeded as the rail on both tracks spread out of gauge and rolled to the field side, resulting in the derailment of the remaining passenger cars. 4. As it was common for drivers to use the section of the Transitway immediately following the crossing to make up time, and because the driver did not expect to encounter a train, the bus was accelerated beyond the posted speed limit. 5. The bus speed of 42 mph (67.6 km/h) exceeded the posted speed limit of 60 km/h by 7.6 km/h just prior to the initial brake application, which increased the stopping distance required. 6. The driver did not initially fully apply the brakes, which increased the bus stopping distance. 7. OC Transpo's training on brake application, which focused on smooth braking to minimize passenger discomfort, may have contributed to the driver not initially applying maximum braking force in an emergency situation. 8. OC Transpo speed monitoring and enforcement activities on the Transitway in the vicinity of the crossing were not sufficient to prevent drivers from exceeding posted speed limits when approaching the crossing, in contravention of recommended safe driving practices. 9. The driver was likely visually distracted by looking at the video monitor during the critical driving sequence of negotiating the left-hand curve and approaching the crossing. 10. Conversations between the driver and a passenger and among passengers near the driver, as well as the perceived need to make an announcement to passengers standing on the upper deck, created a situation where the driver was likely cognitively distracted in the seconds before the accident. 11. OC Transpo did not identify or mitigate the risks arising from driver attention being inappropriately directed at the video monitor when the bus was in motion and from the need to make announcements if passengers were observed standing on the upper deck. 12. The trees, shrubs, foliage and roadway signage on the Transitway right-of-way, as well as the bus front corner and window pillars, obstructed the driver's view of the activated automatic warning devices until the bus was 122.5 m (402 feet) from the crossing, a distance that was slightly less than the recommended stopping sight distance of 130 m (426.5 feet). 13. In addition to distractions that likely influenced the driver, the additional driver workload associated with negotiating the left-hand curve on approach to the crossing likely decreased the driver's ability to detect the activated automatic warning devices. 14. Although the crossing automatic warning devices (AWDs) had been activated before the bus departed from the station, the view of the activated AWDs was obstructed and there was no active advance warning of the train's approach available to the driver. 15. Although not required by regulation, a more robust front structure and crash energy management design may have reduced the damage to the bus and prevented the loss of a protective shell for the occupants. On the morning of September 18, 2013, an OC Transpo double-decker bus collided with a VIA Rail train in Ottawa, Ontario. Six people died, including the bus driver, and about 34 more were injured. The Canadian Transportation Accident Investigation and Safety Board Act specifically provides for the Board to make recommendations to address systemic safety deficiencies posing significant risks to the transportation system and, therefore, warranting the attention of regulators and industry. Under the Act, federal ministers must formally respond to TSB recommendations within 90 days and explain how they have addressed or will address the safety deficiencies. Despite jurisdictional issues, it is important for Transport Canada (TC) to take a leadership role and develop a framework that provides consistent guidance to both the industry and provinces to address the emerging issues related to distracted driving. The Board considers this framework to be an important element in mitigating the associated risks, particularly with regards to railway crossing safety. The Department of Transport, in consultation with the provinces, develop comprehensive guidelines for the installation and use of in-vehicle video monitor displays to reduce the risk of driver distraction. The Canada Motor Vehicle Safety Standards (CMVSS) contain no requirements for frontal impact, side impact, rollover or crush protection for vehicles with a gross vehicle weight rating (GVWR) in excess of 11 793 kg (26 000 pounds), which includes most transit buses. As a result, buses in this weight category can have different structural features that may not adequately protect the travelling public. The Department of Transport develop and implement crashworthiness standards for commercial passenger buses to reduce the risk of injury. All safety, regulatory, law enforcement and company accident investigations benefit from the efficient, timely and accurate collection, assimilation and analysis of available information. In many cases, event data recorders provide and validate much of this valuable information. Early recovery of the information can also result in more timely communication of safety deficiencies and accident reports to industry, regulators and the public, which in turn can result in the implementation of measures to prevent a recurrence. The Department of Transport require commercial passenger buses to be equipped with dedicated, crashworthy, event data recorders. It is recognized that federal guidelines are generally not enforceable, particularly in other jurisdictions. However, the Board considers that guidance similar to that contained in the United States Department of Transportation Federal Highway Administration Railroad-Highway Grade Crossing Handbook would be a useful framework that provides consistent guidance on issues related to grade separation for the industry as well as federal, provincial and municipal road authorities. The Department of Transport provide specific guidance as to when grade separation should be considered. Grade separation projects usually involve multiple jurisdictions with funding provided by the railways, the respective road authority and the federal government. The decision to proceed with level crossings was based on known risk factors in 2004. Since that time, changes have occurred in the risk factors such as area population, number of trains, train speed, the number of vehicles, the resulting cross-product and the average number of vehicle occupants. 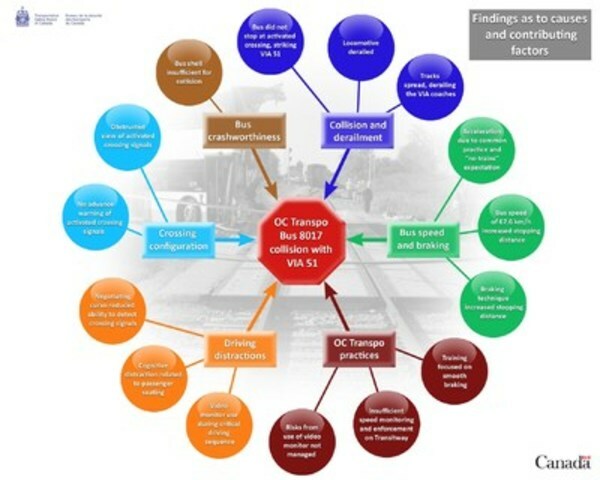 These risk factors will continue to increase with further urban and potential railway development in the area with a commensurate risk that existing level crossing protection may no longer be adequate. The City of Ottawa reconsider the need for grade separations at the Woodroffe Avenue, Transitway, and Fallowfield Road level crossings. Safety concerns are expressed in final investigation reports. A safety concern focusses on an identified unsafe condition for which there is insufficient evidence to validate a systemic safety deficiency, but the risks it poses warrant highlighting. A safety concern provides a marker to the industry and the regulator that the Board has insufficient information to make a recommendation, but that as more data and analysis become available, the Board will return to this unsafe condition if it is not redressed. It is recognized that requirements for a bus to stop at a railway crossing falls under provincial, municipal, and in some cases, transportation company jurisdiction. However, the studies used to support decision-making made on this issue are out of date, incomplete and limited in scope. The absence of good guidance can lead to ill-advised or misinformed decisions that could in turn result in wasted investments that do not effectively mitigate the safety risks and that give people a false level of confidence in the safety of particular practices. Under these circumstances, more up-to-date guidance, based on research and science, would be useful for all jurisdictions. The Board is concerned that, given there is no recent comprehensive study that specifically deals with the risks associated with all buses stopping at all railway crossings, decision-makers may not make the best choices possible to ensure an adequate level of safety. Safety advisory letters are concerned with safety deficiencies that pose low to medium risks, and used to inform regulatory or industry stakeholders of unsafe conditions. A safety advisory letter suggests remedial action to reduce risks to safety.